Manufacturer of a wide range of products which include industrial gas regulator, adjustable high pressure industrial gas regulator, laboratory gas regulator, ss industrial gas regulator, high pressure industrial gas regulator and ss high pressure industrial gas regulator. Being the most respected organization guided by experienced and knowledgeable professionals, we provide an enormous assortment of Industrial Gas Regulator. 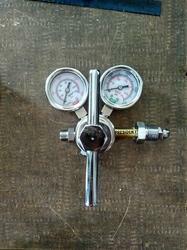 This regulator is highly used for critical high purity cylinder and OEM applications for industrial gas equipment. 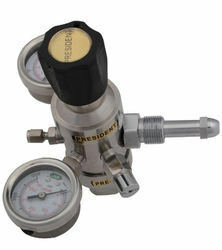 Offered regulator is able to withstand internal vacuums that are generated during the purging operations. 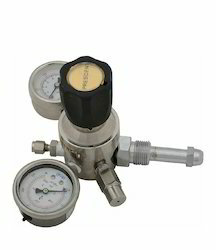 The provided regulator is used for mordant gases such as ammonia, etc. Our regulator can be availed by our prestigious patrons from us at rock bottom prices. Gases Nitrogen, Hydrogen, Zero Air, Argon Helium, Co2 - BF3, Ammonia, Nitrous Oxide, Nitric Oxide, Oxygen, Acetylene, Neon, Methyline or any doping Gases. 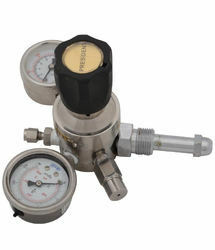 In order to append and respond to the assorted requirements of respectable clients, we are able to offer Laboratory Gas Regulator that is extensively used to regulate the gas flow. 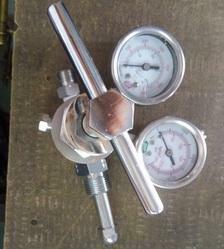 The offered regulator is precisely manufactured by our dexterous professionals from the best quality components and with the aid of contemporary techniques at our premises. In addition to this, the provided regulator is sternly checked by our quality controllers against numerous quality parameters to ensure its quality. We are identified as one of the most competent enterprises of this industry, engaged in offering a wide range of SS Industrial Gas Regulator. The offered regulators are available in various sizes, dimensions and other technical specifications. 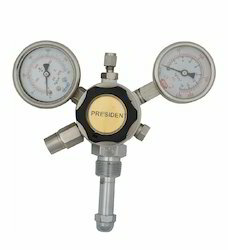 These regulators are manufactured with the advanced techniques as well finest grade components. Due to their attributes such as supreme quality and flawless finish, provided regulators are highly cherished among our clients. Empowered by our immense experience of years in this domain, we are engaged in manufacturing and supplying supreme quality High Pressure Industrial Gas Regulator. With the support of our adroit professionals, the provided regulators are well-manufactured from the superior quality components. In addition to this, our esteemed clients can avail these regulators from us in variegated technical specifications as per their needs. These regulators are suitable for all gases like acetylene, oxygen, nitrogen, argon, carbon dioxide, hydrogen, carbon monoxide, ammonia etc. We are the reputed name in the market, engaged in manufacturing a wide range of SS High Pressure Industrial Gas Regulator. In tune with set industry norms, our offered regulator is well-manufactured by our adroit professionals using the optimum quality components and ultra modern techniques. With the assistance of our team of adroit professionals, we have become the remarkable manufacturer and supplier of qualitative High Purity Industrial Gas Regulator. The offered regulator is designed after knowing all the necessary information about the application for which gas regulator and equipment is to be used like nature of gas, flow requirements, input and output pressure, etc. 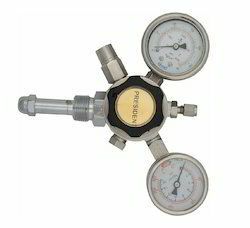 Moreover, the offered regulator is used for manifold pipelines and available in diverse sizes. We take pride to introduce ourselves as one of the renowned manufacturer and supplier of supreme quality Industrial Gas Fountain Regulator. 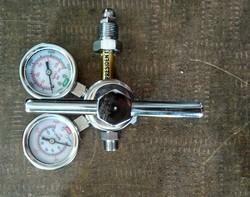 Our provided regulators are widely used in soft drink making industry. The offered regulators are well-manufactured using the optimum quality components and pioneered techniques under the surveillance of our deft professionals. Moreover, these regulators are checked against several quality parameters by our quality analysts to ensure their quality.